Summer is officially upon us. Hope you're all getting your fill of cherries! And thank heaven for multiple varieties to extend our season. The Chelans have given way to the Bings, which WSU lists as ripening 10-12 days later than Chelans. Bings are the cherries of my California childhood, and I remember orchards in San Jose which are probably long plowed under and built over. All those dark red cherries do blend in people's minds, however, to make way for Rainiers, which, also according to WSU, originated in Prosser, Washington, where my in-laws always buy their cars! Rainiers are a cross between Bings and Vans and command top dollar, as you've probably noticed. Since our warm weather came on so early this year, the downside is that our cherries and berries will be done sooner, but I'm happy to report there are some "late season" varieties that will carry us a few more weeks. 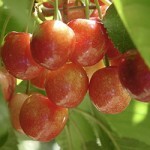 Look for Lapins and some of the "red" cherries as we go along. (Bings are considered "dark" cherries.) WSU reports that Washington State grows the most sweet cherries in the United States, more than double California, most likely because of the plowing under and building over I mentioned earlier... How much is the Washington cherry crop worth? Well, in 2015, nearly $540 million! I don't know about your household, but ours is certainly doing its part to make sure Washington hits its dollar goals again in 2016. And, to return to the organic versus non-organic conversation, I was pleased to hear another Marketgoer asking one of our cherry farmers whether the fruit were spray-free. He replied that no cherries or soft fruits in Washington were spray-free, but that they used organic-approved pesticides, which were sprayed always on the tree and never on the fruit. Basically, the only way in Washington to get soft fruits that have never known a pesticide, organic or conventional, would probably be to grow it yourself. Darn. Everyone has their standards, but I don't think I could ever give up soft tree fruits (peaches are my hands-down favorite), so organic pesticide will just have to do. In other news, did you read our Market Director Natalie Evans' interview on the blog Fried Dandelions? Give it a go here, as Natalie talks about the new Power of Produce (POP) kids' program. 53 kids signed up the first week!!! Amazing. Hope POP develops another generation of produce lovers. And I did mention that summer is here? That means eating dinner or at the Market or picking up some burger patties or sausages for the grill. Bliss.